A lot thoughts for a lot of cockpit builders is going into the Intercom System. There are some very good and very real easy to use replicas available. Seems the best out there is the one from Ruscool. 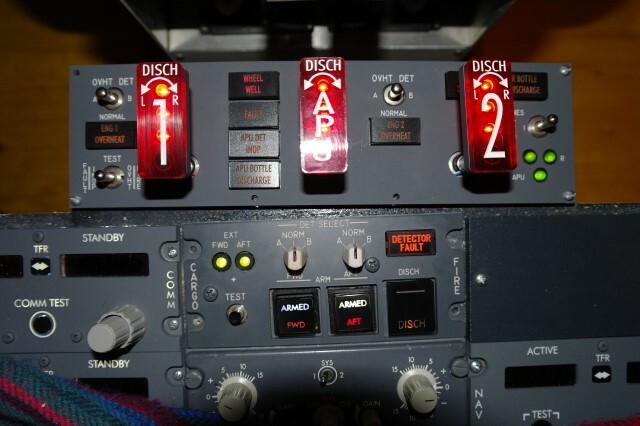 Most of the time I am flying alone in my flightdeck, therefore I don’t need those more expensive solutions. I tested and figured the following solution for me. It’s working, its simple and its cheap – although its not 100 percent real. First I have to explain my setup a little. I have one PC running vpilot and handles the communication to the VATSIM ATC. On this machine there are 2 headsets connected. Each one has a separate USB Soundcard, where the 2 3.5mm connections are connected. 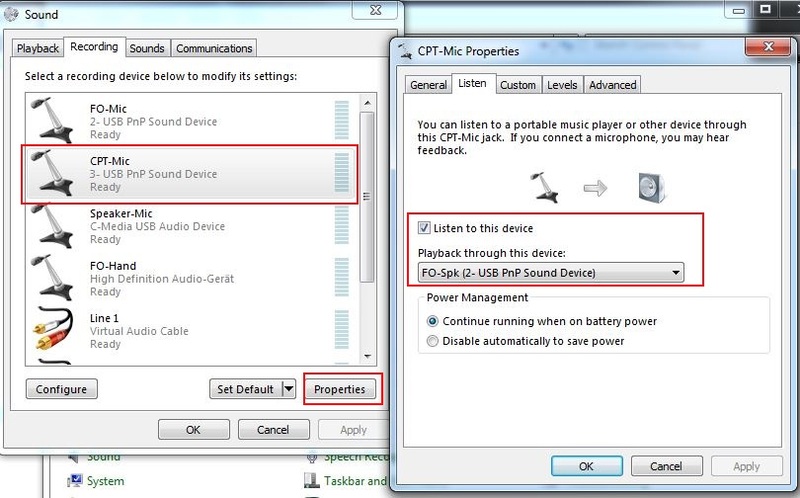 In the windows system config the configuration is made that the loopback device from the captains mic is the first officer headset and vice versa. So everytime the captain speaks the first officer will hear him. Not perfect, but it’s working. 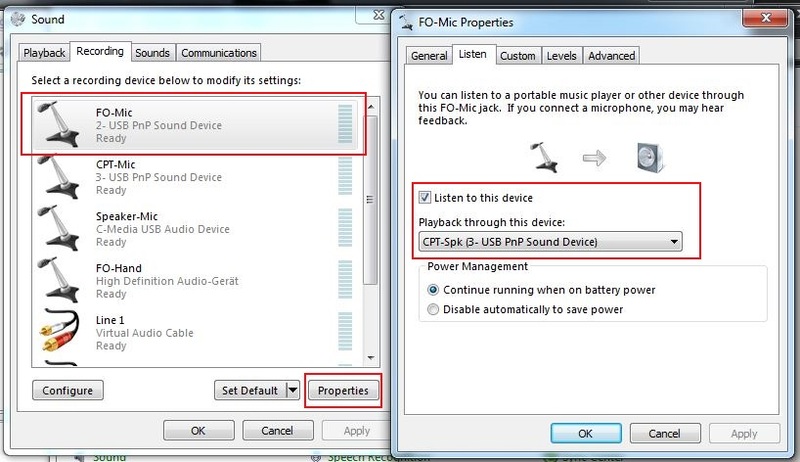 If you want stop transmitting to the intercom, you can disable the mic input via a switch on the Plantronics GameCom 388 Headset. Sounds simple? It is 🙂 As I sayed not perfect, but its working and sounds quite real. I have tested a 360° camera during the last days. With that you can make some pretty pictures from scenes with an amazing angle. To view the pictures in full resolution, click here. During the release of ProSimv2 I also noticed the possibility of a weather radar test. 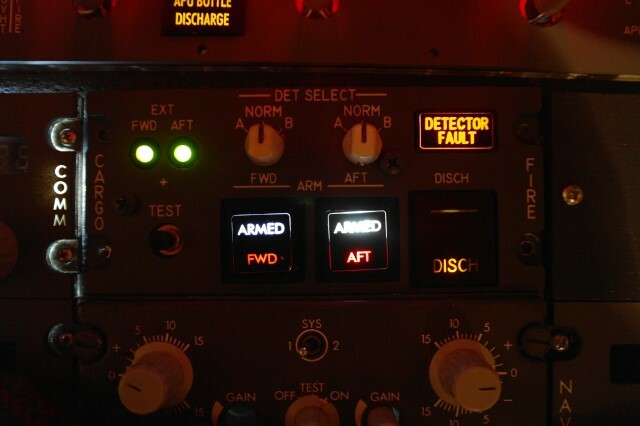 My switch from the radar was not working correctly, so I thought it is defect. 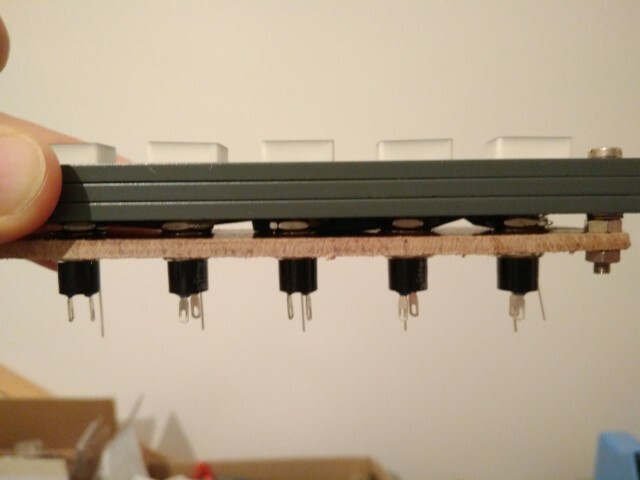 Therefore I have disassembled the whole module and tested all switches. I found a failure in the cabling which I made many years ago. Now with Prosim 2.0 its possible to assign a SELCAL function. You can reset it when you push the button. It took also some years, but I have found now a second hand Opencockpits COM2 device with white digits. I have it built in already into the pedestal and configure it into my SIOC script and Prosim. It’s working like it should. Now I am able to hear to the ATIS when connected to the primary frequency. Also from hispapanels I got the dummy SELCAL panel. But I decided to make it as a functional panel. So I made some modifications. The green LEDs came with the panel and where glued into it. 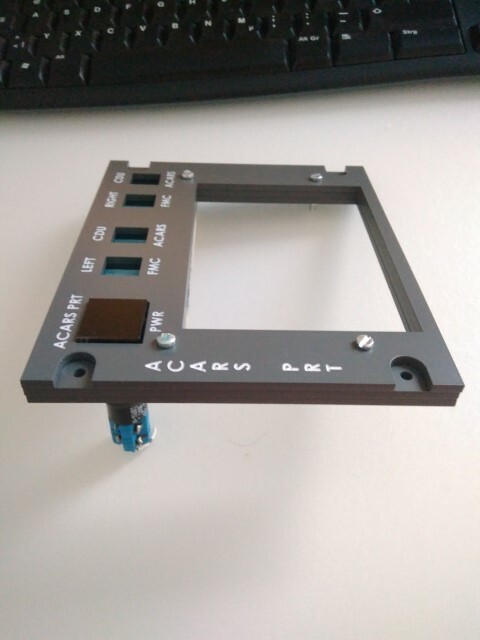 To have some round push-buttons installed a whole must be drilled into the panels. 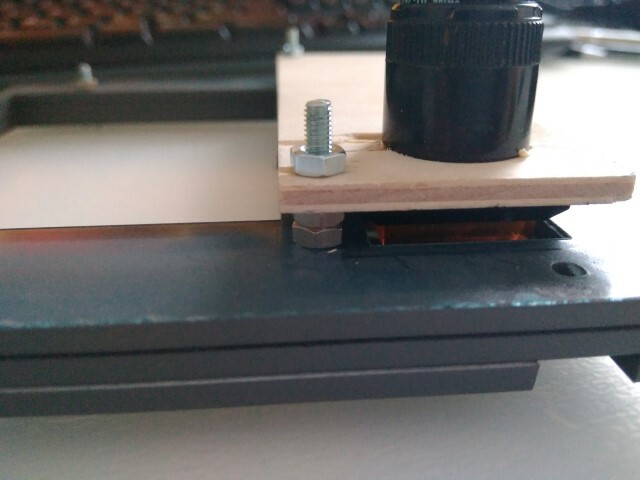 I took some 6mm buttons to be placed under the push buttons. The buttons are fitted on a small helper wooden part. In a future release of Prosim the SELCAL panel will be enabled by the Prosim Team. 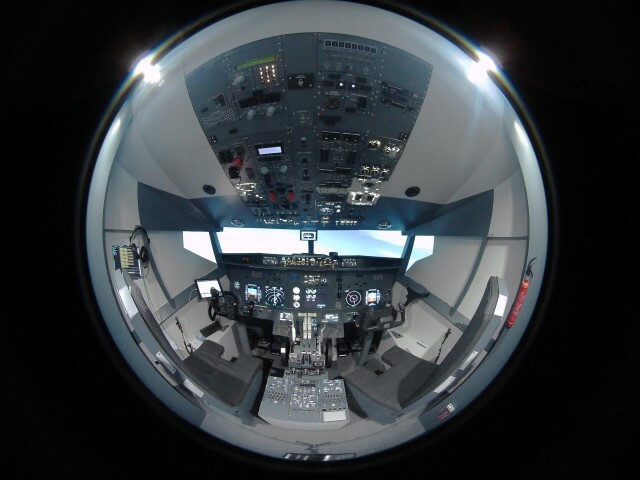 It can be linked to VATSIM via the PSU (ProsimUtils) and vpilot. I will make a separate entry in the blog when it is available. 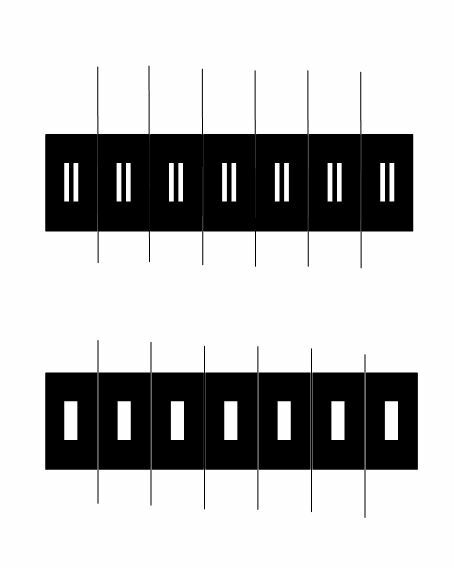 The buttons and LEDs are planned to be connected to another Pokeys Ethernet card. 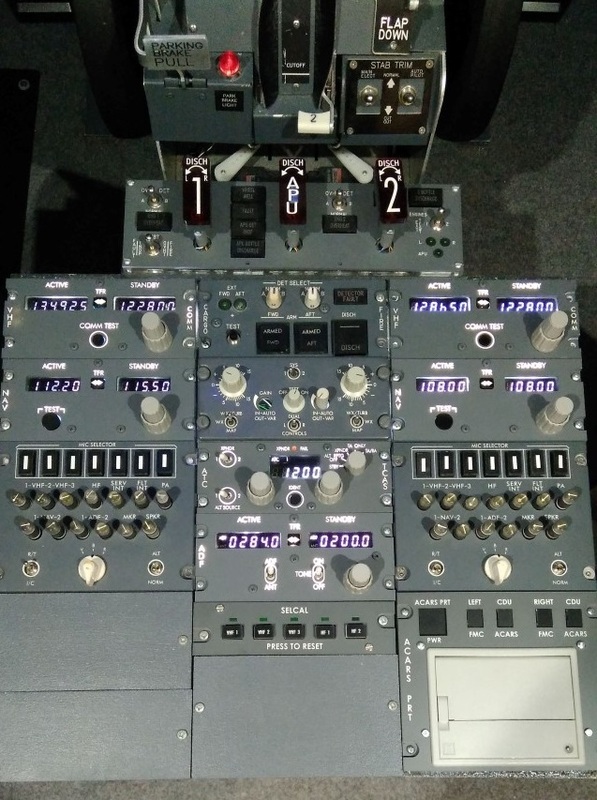 The only drawback is, that the buttons are now a little higher than original, as the push-button is placed below. 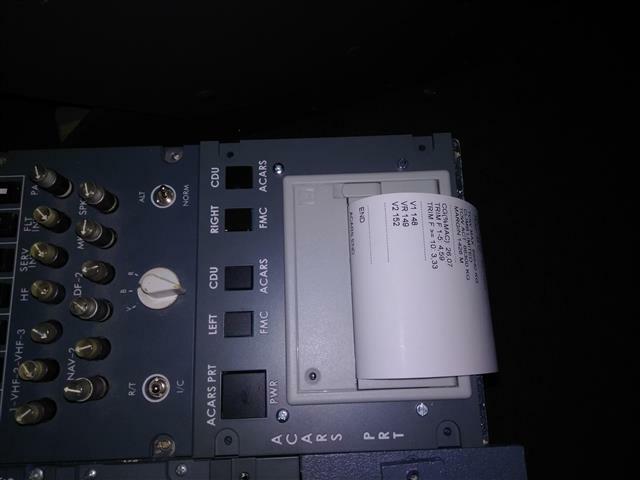 When I got my ACARS printer, back in 2011 I installed it in my homemade pedestal box without any panel. 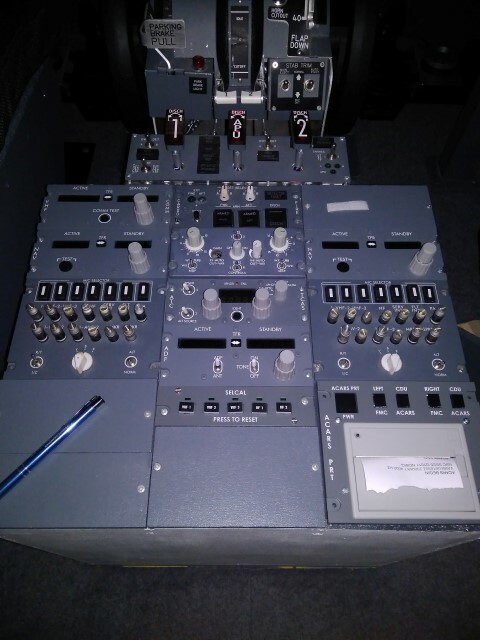 My plan is that I connect buttons beyond the dummy switch plates, that I can use it for future functions in the cockpit. Also the power switch should be wired and functional. 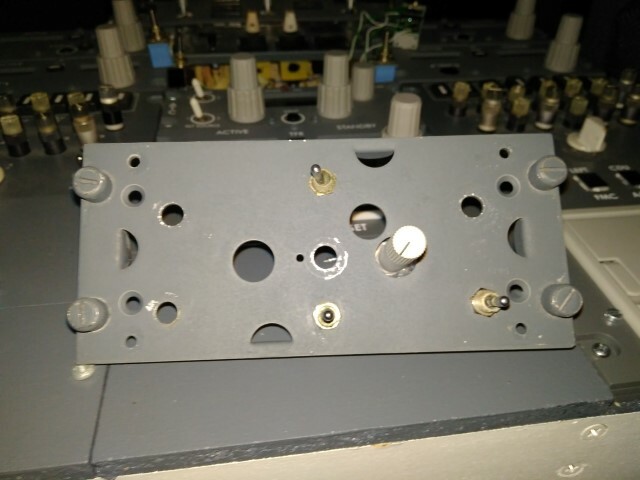 For this I will have to built a construction below the panel that holds my buttons in place. For now only the power button was built in and connected to cut the power to the printer. This is needed when the printer needs to be restarted, happens not very often, but sometimes. 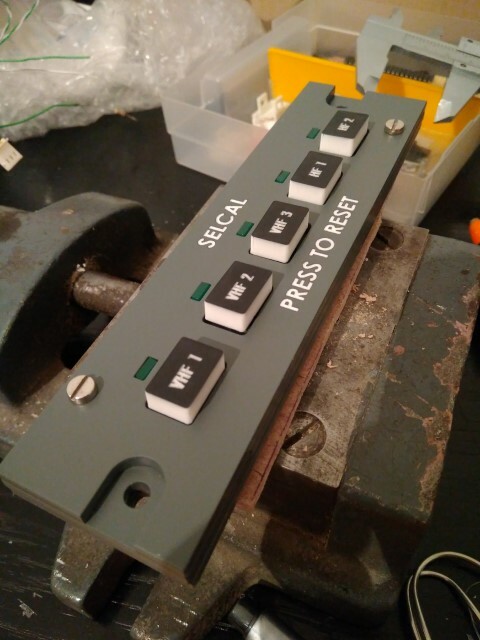 My old Audio Selector Panel, which I purchased second hand years ago, was lacking on the button decals. Those looked used and started to peel off. Therefore I have now created new decals. In case you need it, you can download it here. Audio Selector Decals	(190 downloads) . I printed it on a sticker paper and cut them manually. So a nice and simple fresh look for the old fake buttons. As a request on a forum I have created 3 Videos were you can see and hear the bodyshaker in action. 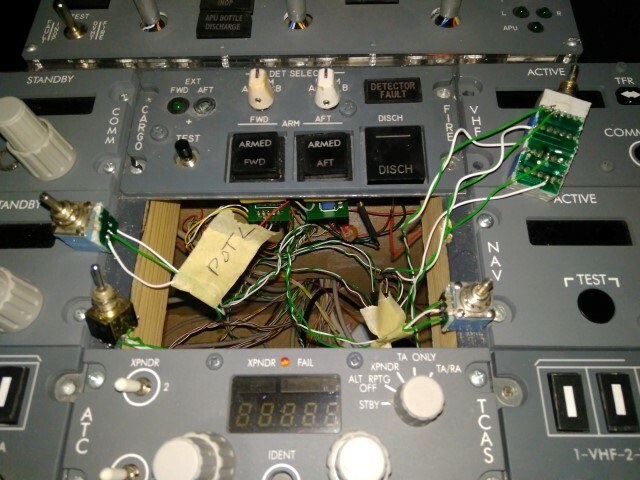 After the landing in Vienna there is also a short demonstration of the wired firepanel. 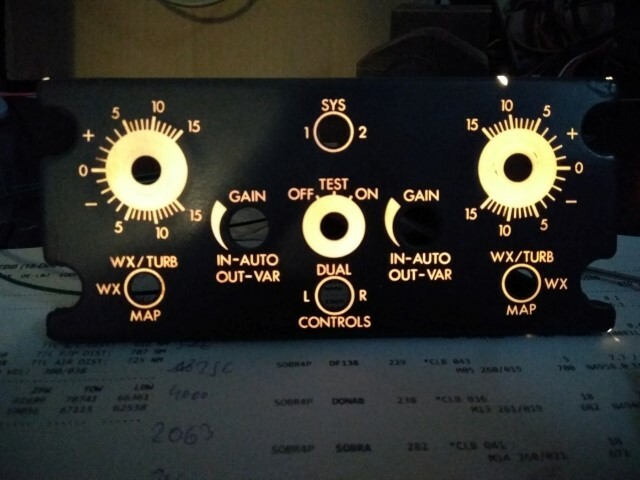 Some years ago I have purchased a second hand cargo fire panel, but it was never connected until now. I started working on a plan to connect it and once finished, the plan was executed. The one lowlight is that the Discharge button was glued into the panel, so I had no chance to use it. 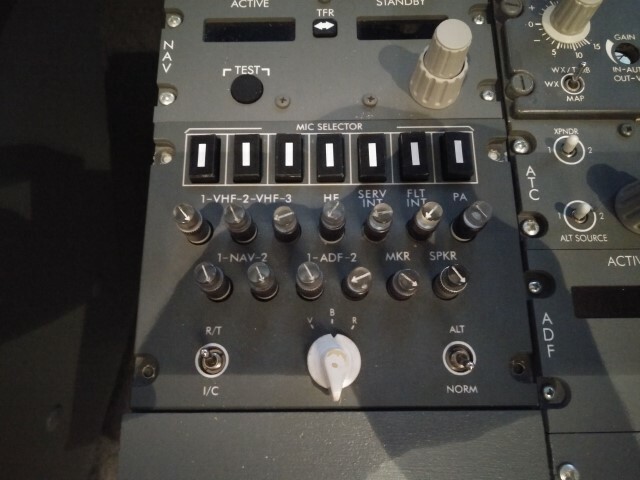 Therefore the function of this switch was moved to the aft. overhead, as I had there one free unused button. It turned out that I had to fully adopt the panel for my need. 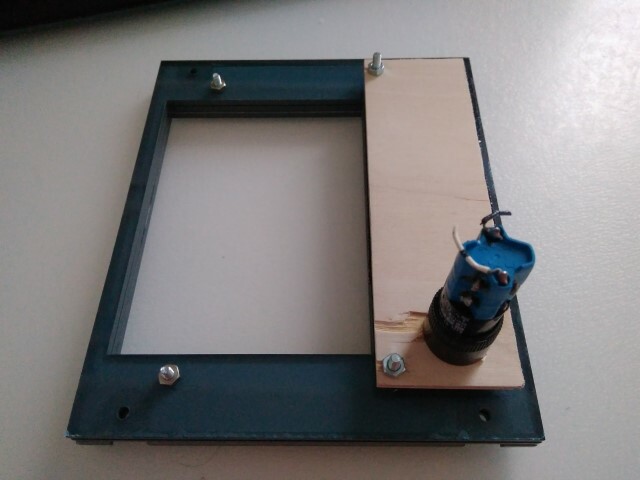 The 2 LEDs in the Pushbuttons were connected on their cathode and will light up when +5V are connected to the anode. But my Setup with the Opencockpits cards have the anode in common and the cathode the switched one, so the 2 buttons have to be reassembled to meet the requirement. One button worked fine with the second one the LEDs got destroyed. So I have to reinstall 2 new LEDs and connect them. Also the 2 green lights were 12V light bulbs, which you cant see with 5V. Therefore those were changed to green LEDs.